SharePoint Bulk File Upload Web Part is an easy and simple tool to upload multiple files or documents to a SharePoint document library. SharePoint Multiple Documents Upload Web Part is a Silverlight web part for easy & simple uploading of multiple documents to SharePoint 2016, 2013, 2010, or 2007 document library. SharePoint Bulk File Upload allows SharePoint users to upload multiple files into the document library in a quick and convenient way, monitor the upload process, and view the files you are working with. 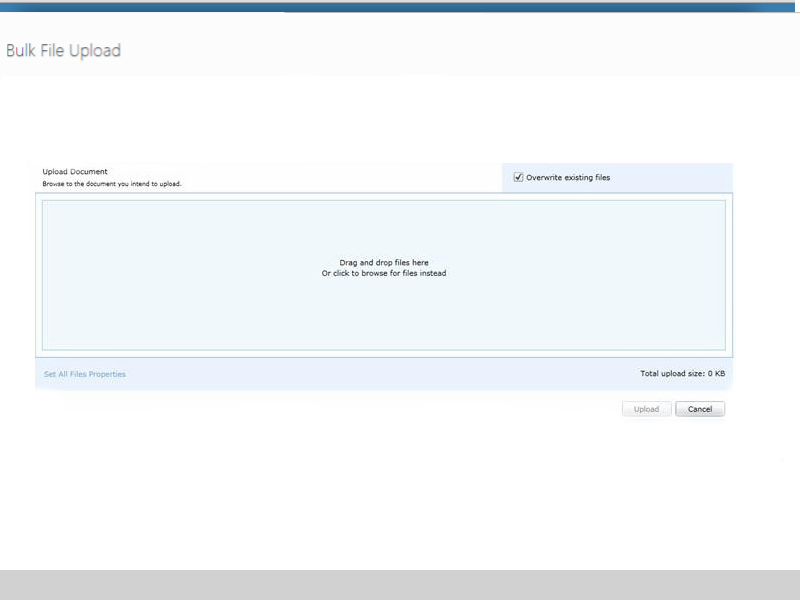 You can also try HTML5 SharePoint File Upload Web Part for better user experience in SharePoint 2013. With Virto SharePoint Bulk File Upload, you can quickly upload multiple files to your SharePoint list or document library by simply selecting the files and clicking the upload button. No need for the redundant task of the same action repeatedly for each of files. 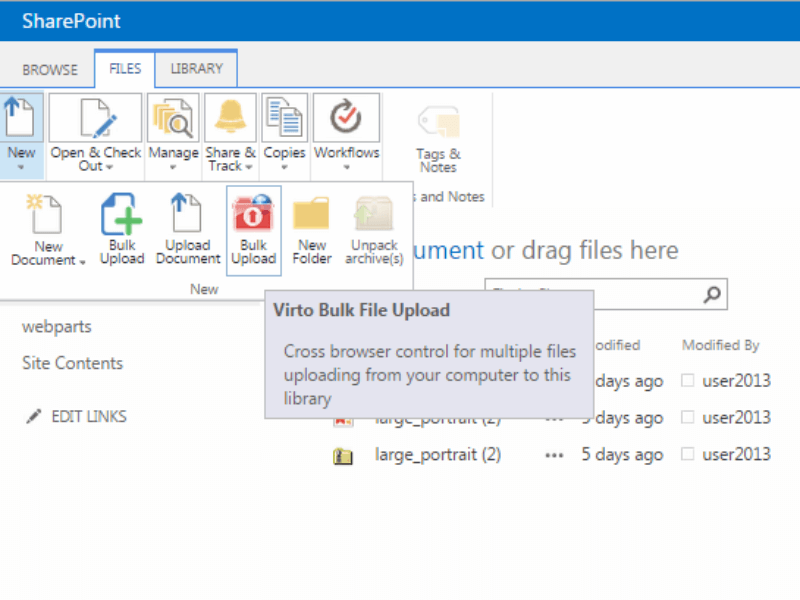 Virto SharePoint Bulk File Upload supports drag and drop mode. Just drag files to the upload window and start the process. No more rejections of large files adding to your collection! 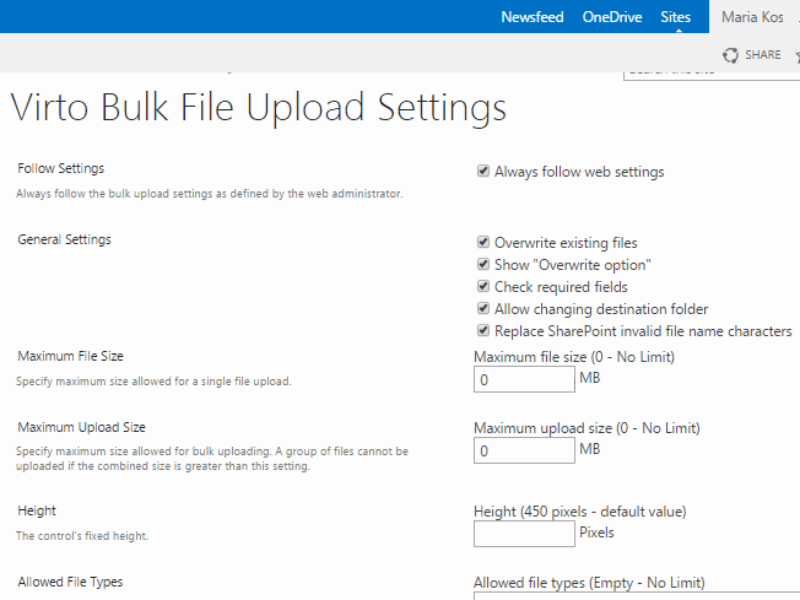 Using Virto SharePoint Bulk File Upload, you can now upload large files up to 2GB! You can set multiple files properties before upload. If your uploading process gets interrupted or some of the files are not approved for uploading, don't fret. With Virto SharePoint Bulk File Upload, your files that have been approved would have been succesfully uploaded, so no need to redo the process over again. There are two options - adjust Upload web part for every document library or list (when you need specific settings for each case) or define the upload settings for the whole SharePoint farm. SharePoint Bulk File Upload Web Part allows users to upload multiple files into a document library in a quick and convenient way. 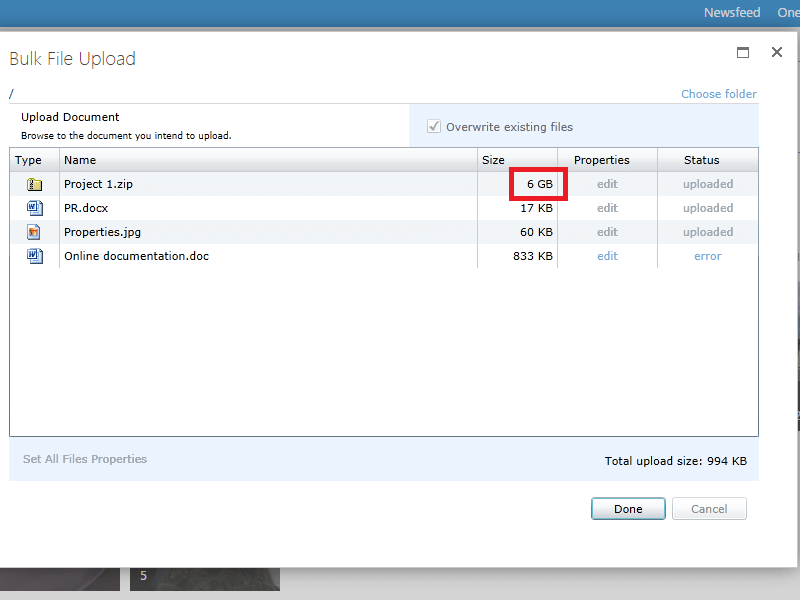 Monitor the upload process and view the files you are working with. It has a wide range of settings that will help you manage any files during the uploading process into SharePoint, set meta data, resize images, and use many other features. This product is a part of Virto SharePoint Bulk Operations Toolkit and Virto ONE License. Upload Bulk files to SharePoint document library Upload multiple files with drag & drop instead of separate adding of every file. Ability to upload multiple files viewing list item Upload multiple files right while viewing a list item. Files uploading progress bar You can monitor the file uploading process (especially for large files). Enabling/disabling an ability to overwrite existing files while uploading You can use (enable) this option when the file is supposed for future updating, for example. To avoid the duplication effect, existing files can be overwritten. 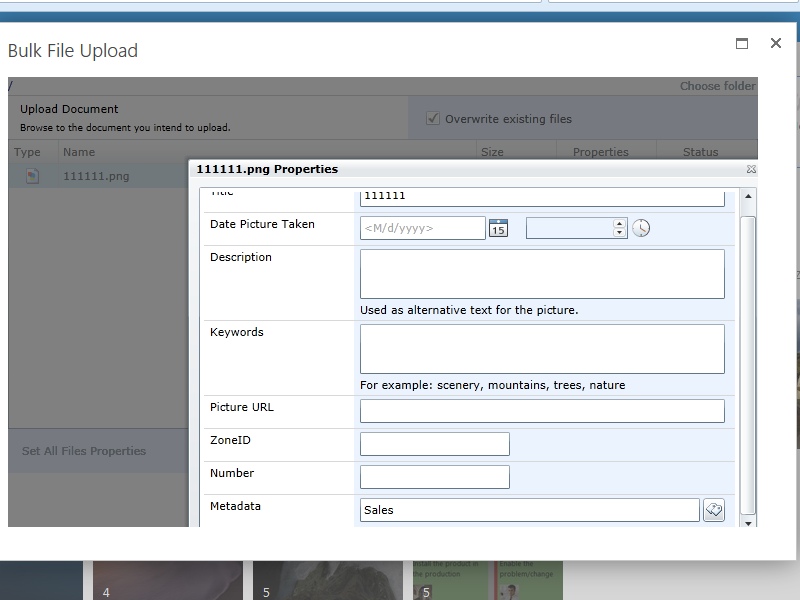 Uploading files with drag and drop E.g. open the file location on your disc and drag & drop all the project files to the project library on your SharePoint site. Files custom meta data enabling Supported ability to enable custom meta data. Multiple OS support Windows and Mac are supported. Partial uploading if the process in canceled You can upload the approved files in case of upload process cancellation and not to start the uploading from the beginning. Uploading large files (Up to 2Gb) E.g. upload video and images with high extension to the libraries. Images thumbnails and previews When images are uploaded you can preview them to guess which of them exactly you are working with. Restrict the type of files users can select E.g. disallow users to upload images. Ability to set maximum file size to be uploaded Manage the size of uploaded files and define the maximum size to avoid too large files uploading. Uploading files to different SharePoint objects You can upload files to SharePoint lists, libraries and etc. Automatic images resizing before uploading E.g. define 800*600 size for uploaded screenshots of your software products designed. 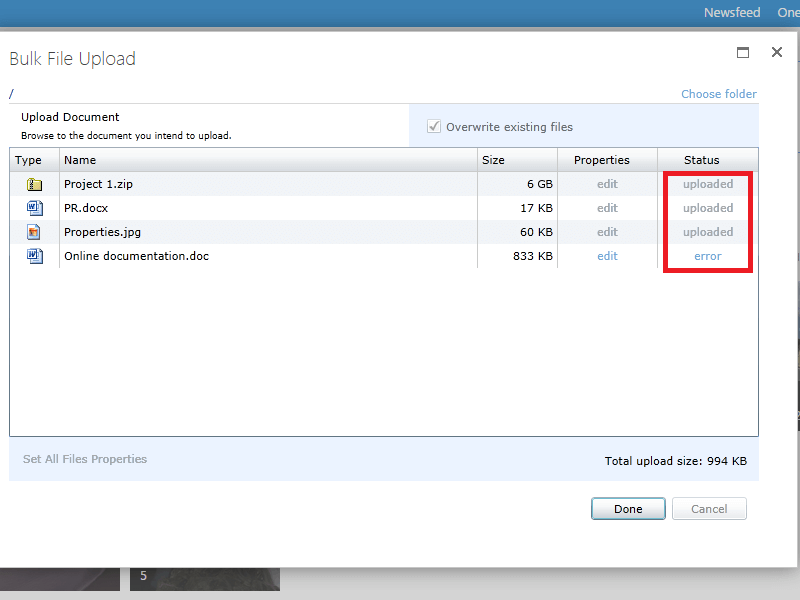 Upload files to server folder You can select the exact server folder where the files will be uploaded to. Ability to define upload settings for SharePoint farm You can define upload settings for the whole farm to skip adjustment of upload for every location. Easy selection of values from external data column with autosuggestion or from a grid (for SharePoint 2010 & 2013) Supported selection of values from external data column with adjusted autosuggestion or from a grid. Unlimited amount of content types and fields in the list is supported Upload document files, images, video, datasheets, presentations or any other files you need. Easy SharePoint uploader tool with drag and drop feature and an ability to upload multiple and large (up to 2GB) files/documents to your SharePoint. This web part for bulk upload to SharePoint is my favorite. Really simple sharepoint uploader tool that allows to upload multiple files or documents to a SharePoint document library. Try this sharepoint upload web part and you won't regret! Costly, but I am quite impressed with the results of SharePoint bulk file upload. The speed and efficiency are worthy to be mentioned. We started to use it and it really made a huge difference. I`ll recommend it. Very useful and easy to customize. This should be base functionality in SharePoint. Uploading used to be a strenuous task to do, but now with the Virto Bulk File Upload, I no longer dread the task of uploading. Drag & drop feature makes uploading a breeze and I can even monitor the progress through the file uploading progress bar! Small smart web part for upload multiple files to SharePoint. Easy manage even large files and upload multiple documents.